This represents '#pragma omp target data' directive. 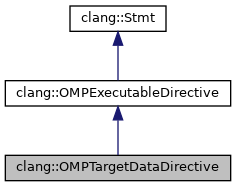 In this example directive '#pragma omp target data' has clauses 'device' with the value '0', 'if' with condition 'a' and 'map' with array section 'b[:]'. Definition at line 2369 of file StmtOpenMP.h. Definition at line 2413 of file StmtOpenMP.h. Definition at line 792 of file StmtOpenMP.cpp. N The number of clauses. Definition at line 805 of file StmtOpenMP.cpp. Definition at line 2370 of file StmtOpenMP.h.